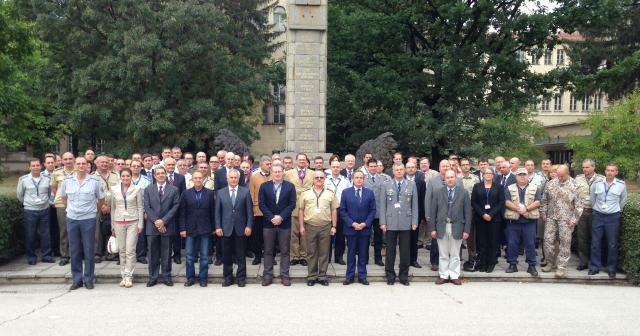 More than 80 Subject Matter Experts from 14 Nations and 150 participants met in Sofia (17-18 September) to discuss Interagency Cooperation in Crisis Management and Disaster Response (CMDR) at a seminar organized by the CMDR COE. The keynote speakers of the seminar were Mr. Jean-Dominique DULIÈRE, Head of the Crisis Response Systems and Exercises Section (CRSE) in NATO HQ and Mr. Kevin LAWRENCE, Tennessee Emergency Management Agency (TEMA), as well as Ambassador Valery RATCHEV, expert of the Center for Security and Defence Management at the Institute for Information and Communication Technology (BAS). The Deputy Chief of Defence Rear Admiral Georgi GEORGIEV opened the seminar, held in the National Defence Academy "G.S.Rakovski". Numerous experts from different government and non-government organizations, state agencies and private companies took part in the seminar. Among the participants were representatives of the Ministries of Defence and/or the Armed Forces of Austria, Bulgaria, Croatia, Hungary, Latvia, USA (including US EUCOM, USAID/OFDA, LANDCOM), EUMS, as well as representatives of the CIMIC COE, Combined Joint Operations from the Sea COE, Italian Army Post Conflict Operations Study Centre, NDU (USA), Baltic Defence College, Bulgarian Academy of Science, Bulgarian Red Cross, BULSIM, Bulgarian Ministries of Interior, of Regional Development, of Transport, Information Technology and Communications, of Economy and Energy, of Environment and Waters, and others. - e-learning, strategic communications and leadership in CMDR. Several companies – SAAB, Presagis, Pitch Technologies, Alion Science and Technology, ATOS, MASSA, Synergy Horizons also contributed to the plenary sessions and demonstrated their products, software and tools in CMDR area. The international seminar "Interagency Cooperation in Crisis Management and Disaster Response. Tools and Practices for Training" aims to improve the common understanding of interagency cooperation in the area of CMDR and to contribute to the Comprehensive Approach in this field. All articles and reports, presented at the seminar will be published in the CMDR COE proceedings from the seminar.